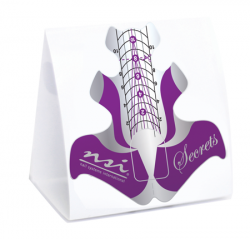 After natural nail prep is done, apply an NSI Stiletto Nail Form making sure that the form fits tight and snug. Apply a thin layer of Attraction Totally Clear Powder and extend it past the free edge and onto the form, creating a platform for your colours to sit on. Pinch form until product has set up. Then, carefully remove form and file into shape. 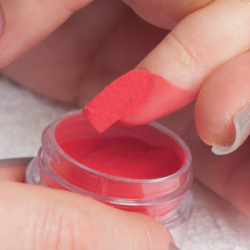 Using an Opaque colour Attraction Powder, cover the natural nail plate and create a smile line. Once cured, using an Endurance File 180/180, refine file the smile line to give it a crisp edge. Using the Simplicité Powders, colour of your choice, start application at smile line and feather your first colour out. Apply second colour slightly on top of first and repeat process. 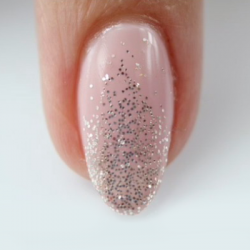 Using Attraction Totally Clear Powder and your choice of Secrets Sparkle, add dimension to your design. Encapsulate your entire free edge using Attraction Totally Clear Powder. Continue to pinch your free edge while your product is setting up. 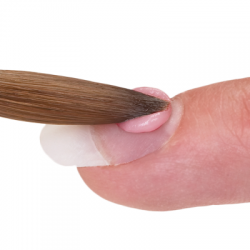 Refine file using NSI Endurance File 180/180 and than buff the entire nail using the Endurance Buffer 180/240. Wipe with a nail wipe saturate with Cleanse to remove all dust. Using acrylic paint and a one stroke brush, mix and blend your colours creating a flower design. Continue adding different colours to give depth and dimension. Allow paint to completely dry. Using Glaze ‘n Go LED, apply a thin coat to the entire nail and cure in the Dual Cure Lamp, LED for 30 sec or UV for 2 min. Glaze ‘n Go LED coat cures tack-free so there is no layer to remove. Apply Nurture Oil and gently massage in.